I feel terrible because I accidently dropped my iPad Air 2 days ago. The only thing that got damaged was the screen became crack. Other than that everything else on the iPad is working fine and I can’t see any other physical external damage but unfortunately it won’t be fixable under warranty! Question one: How do I get my iPad fixed? Choose the service and repair option that’s best for you. Send it in: Request a box and send your iPad to an Apple Repair Center. Bring it in: Set up an appointment at an Apple Store or an Apple Authorized Service Provider. Question two: How much does it cost? Your iPad is over one year old. Your iPad screen gets broken accidentally. Your iPad has other accidental damage or issues caused by unauthorized modifications. If your iPad issue isn’t covered, you’ll pay an out-of-warranty fee unless your iPad has AppleCare+ coverage. AppleCare+ includes two incidents of accidental damage. You might be able to use one of those incidents for a cracked screen or for other damage to your iPad. If your battery needs replacement, Apple can repair or replace your iPad for a battery service fee. There’s no fee if your battery is defective and your iPad is covered by warranty, consumer law, or AppleCare+. Question three: How long will it take? Depending on the type of service, your repair might take up to 5 business days. If your iPad was engraved by Apple, it could take up to 10 business days. 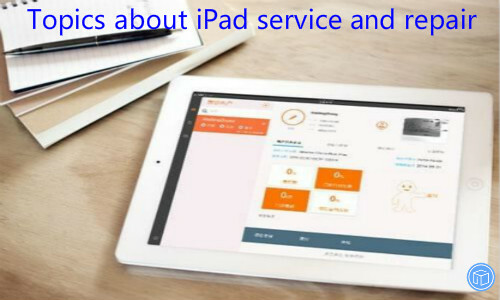 After Apple receive your iPad, you can check the status of your repair. Question four: What should I do before I send my iPad to Apple? Before you send your iPad to Apple, be sure to back up your data and prepare your iPad for replacement. Your replacement device won’t have your data on it, and you’ll need to restore that data from your backup. You can also selectively transfer specific data to computer with the help of iFonebox. After Apple receive your iPad, they’ll send you information about repair, replacement, and fees. If your iPad needs to be replaced, they’ll ship a replacement to you with factory settings. Your replacement iPad will be new or equivalent to new. This entry was posted in Tips and Tricks and tagged hot topics about ipad service and repair by IosdroneD. Bookmark the permalink.